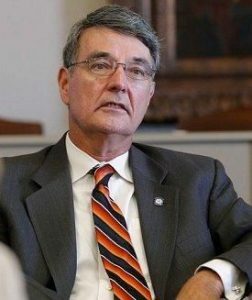 OKLAHOMA CITY – State Rep. Doug Cox confirmed Thursday that he intends to work with other legislators and the state board of Medical Licensure and Supervision on reform measures that protect physicians from unjustified prosecutions. Cox, a physician, intends to meet with Rep. Richard Morrissette (D-Oklahoma City), supporter of a bill that would change the model for investigating doctors and enhance due process rights, and state board Executive Director Lyle Kelsey. Cox said he would like for the meeting to occur sometime this summer or early fall. Morrissette was happy that Cox (R-Grove), who earlier opposed HB 1412, was willing to discuss reforms that would allow physicians to defend themselves before an impartial panel. Kelsey was out of the office and unavailable for comment Thursday. The lawmakers’ comments came after the House approved new governance and conduct rules for the Oklahoma Board of Dentistry. The new rules were sparked after a Tulsa dentist was accused of exposing patients to HIV and Hepatitis B and C due to filthy conditions in his clinic. Morrissette has said publicly the state medical board should examine its rules for investigating and prosecuting doctors. The lawmaker received a dozen calls from physicians who supported HB 1412, but would talk publicly for fear of retribution by the board. The Oklahoma Board of Medical Licensure and Supervision has come under public scrutiny because of deceptive practices and failure to adhere to due process rights for physicians it investigates and prosecutes. The measure was written, in part, because of a case involving Tulsa spine surgeon Steven Anagnost, who endured years of persecution by the state medical board with no finding of wrongdoing. Anagnost was never disciplined, retains his medical license and continues to practice in northeast Oklahoma. The surgeon contends in an Oklahoma County District Court lawsuit that the board, competing surgeons and medical practice attorneys conspired to take away his medical license. When told about Cox’s comments, Anagnost said he was pleased that the effort to change the medical board’s policies is moving forward. HB 1412, which can be considered during the 2016 legislative session, would change the entire system when complaints are filed against physicians. Using Kentucky’s model, a newly-created 11 member board would be divided into two panels of five members, excluding the board president. Each panel would have the power to act as an inquiry or hearing panel. Each grievance would be heard by an inquiry panel which would issue a written report. If the panel determined that a violation occurred, the case would go before a separate hearing panel, which will serve as the trial body. No member of the inquiry panel could also serve on the hearing panel. Currently, Oklahoma’s state medical board serves as the inquiry and hearing panels without any separation of powers. Anagnost, own the Oklahoma Spine and Brain Institute and were once owners of the Tulsa Spine and Specialty Hospital. Soon after, malpractice lawsuits were filed against Anagnost, who had never been sued since opening his Tulsa practice in 1999. Anagnost, a pioneer in Minimally Invasive Spine Surgery (MISS) in Oklahoma, had developed a successful practice that involved about 40 percent of all spine surgeries in Tulsa. The MISS technique provides a shorter recovery time and is less expensive than traditional spine surgery, according to a report prepared by longtime healthcare administrator Mike Lapolla. Some of the lawsuits created a conflict of interest controversy since two were filed by then-medical board member Gary Brooks, a medical malpractice attorney, and attorney Randy Sullivan, who also serves as a medical board prosecutor.